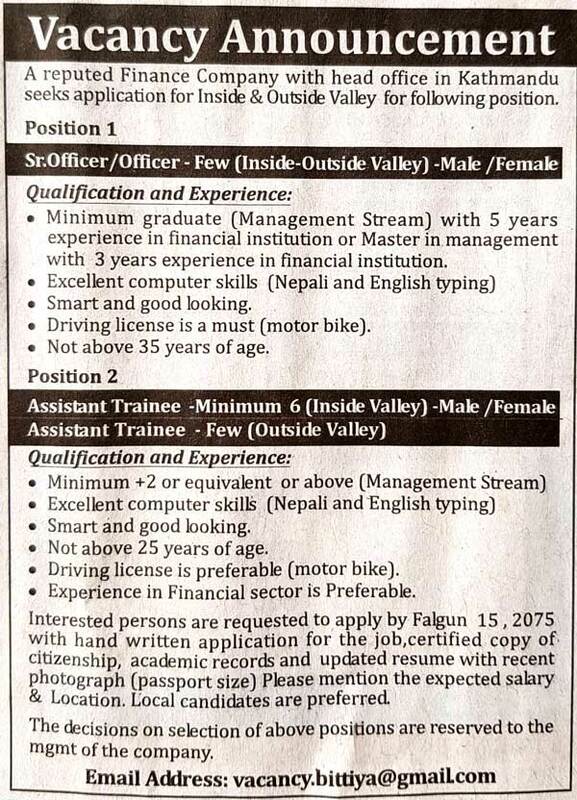 A reputed Finance Company with head office in Kathmandu seeks application for Inside & Outside Valley for following position. > Minimum graduate (Management Stream) with 5 years experience in financial institution or Master in management with 3 years experience in financial institution. > Smart and good looking. > Driving license is a must (motor bike). > Not above 35 years of age. > Age not above 25 years of age. > Driving license is preferable (motor bike). > Experience in Financial sector is Preferable. Interested persons are requested to apply by Falgun 15, 2075 (27 Feb 2019) with hand written application for the job, certified copy of citizenship, academic records and updated resume with recent photograph (passport size). Please mention the expected salary & Location. Local candidates are preferred. The decisions on selection of above positions are reserved to the mgmt of the company.